This item is discontinued, but don't fret. We have a much better one in the form of the Adafruit motor driver shield for Arduino here. Arduino Motor Driver Shield Kit. Building a robot? Need to move something with Arduino? 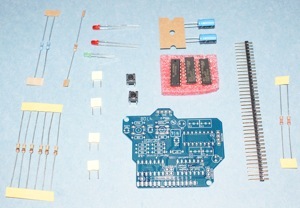 Check out this motor driver shield kit. Solder this kit together, and you can drive 2 motors (up to 12v) in forward and reverse.